My husband’s pride and joy from our garden this year. We picked up the seed packet during a visit to Monticello (part of The Thomas Jefferson Center for Historic Plants collection) and planted some for the first time last year. Unfortunately, we grew only one lonesome “Cheese Wheel,” most of which was enjoyed by our backyard squirrels. This year was different, though. 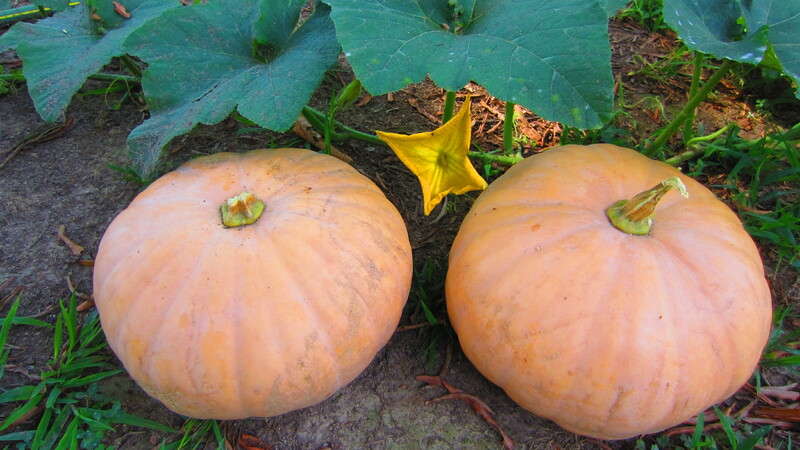 To our delight, this old, Long Island Heirloom has been prolific and grew ten plump, delicious, and versatile winter squash that made my husband’s gardening efforts more than worthwhile this year. We look forward to making soups and pies, and sneaking the puree of this vegetable into our children’s macaroni and cheese, muffins, and anything else we can imagine. You can pick up your own packet of this heirloom variety at Monticello’s Heritage Harvest Festival coming up on September 14th and 15th. What is the pride and joy of your garden? Post a picture for us on Facebook and tell us about it!